Re-designed definitive stamps of Finland were introduced, beginning in 1875. The serpentine roulette separation methodology was retired, and it was replaced with perforation methodology. 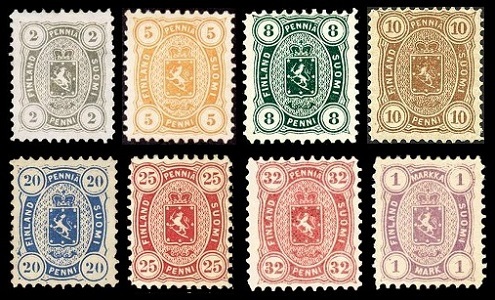 The eight major-denomination-type stamps of Finland shown above were issued between 1875 and 1883. The new stamps are typographed on unwatermarked paper. The common design features a smaller Finland Coat-of-Arms in a large oval and the denomination numeral within a circle, in each of the four corners. 32 P. (1875 - Sc. #16) - Lake. 02 P. (1875 - Sc. #17) - Gray. 05 P. (1875 - Sc. #18) - Orange, Yellow. 08 P. (1875 - Sc. #19) - Blue Green, Yellow Green. 10 P. (1881 - Sc. #20) - Brown. 20 P. (1875 - Sc. #21) - Ultramarine, Blue, Prussian Blue. 25 P. (1879 - Sc. #22) - Carmine, Rose. 32 P. (1875 - Sc. #23) - Carmine, Rose. 01 M. (1877 - Sc. #24) - Violet. 02 P. (1881 - Sc. #25) - Gray. 05 P. (1881 - Sc. #26) - Orange. 10 P. (1881 - Sc. #27) - Brown. 20 P. (1881 - Sc. #28) - Ultramarine, Blue. 25 P. (1881 - Sc. #29) - Rose, Carmine. 01 M. (1882 - Sc. #30) - Violet. 05 P. (1881 - Sc. #26d) - Orange. 10 P. (1881 - Sc. #27a) - Brown. 20 P. (1881 - Sc. #28d) - Ultramarine. 20 P. (1881 - Sc. #28e) - Blue. 25 P. (1881 - Sc. #29c) - Rose. 25 P. (1881 - Sc. #29d) - Carmine. 01 M. (1882 - Sc. #30a) - Violet. 05 P. (1881 - Sc. #26e) - Orange. 10 P. (1881 - Sc. #27b) - Brown. 20 P. (1881 - Sc. #28f) - Ultramarine. 20 P. (1881 - Sc. #28g) - Blue. 25 P. (1881 - Sc. #29e) - Rose. 25 P. (1881 - Sc. #29f) - Carmine. Scott catalog numbers 19, 23, 27, 28, and 29 were reprinted in 1893. The reprints are perforated 12 1/2 and the shades are different. They are inexpensive. 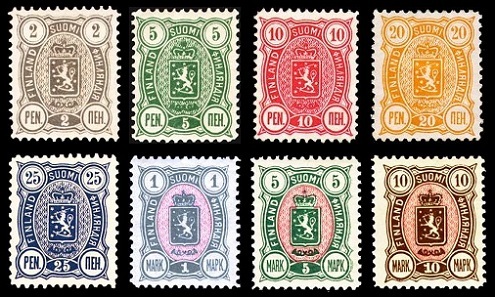 The seven definitive stamps of Finland shown above, featuring new colors and new high-denominations, were issued in 1885. The new stamps are typographed on unwatermarked paper, and they are all perforated 12 1/2. 05 P. (1885 - Sc. #31) - Emerald, Yellow Green. 10 P. (1885 - Sc. #32) - Carmine, Rose. 20 P. (1885 - Sc. #33) - Orange, Yellow. 25 P. (1885 - Sc. #34) - Ultramarine, Blue. 01 M. (1885 - Sc. #35) - Gray & Rose. 05 M. (1885 - Sc. #36) - Green & Rose. 10 M. (1885 - Sc. #30) - Brown & Rose. 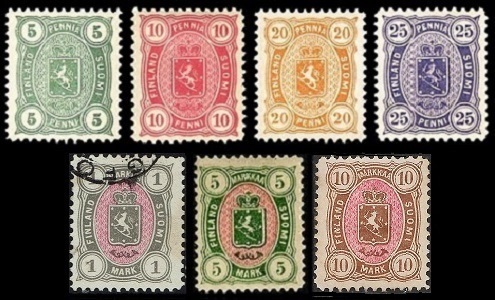 The eight new definitive stamps of Finland shown above were issued between 1889 and 1892. The new stamps are typographed on unwatermarked paper, and they are all perforated 12 1/2. The common design is similar to that of the stamps issued from 1875 to 1883, but the lower circles now have the abbreviated denomination name, with a colored oval between them containing a white denomination numeral. 02 P. (1890 - Sc. #38) - Slate. 05 P. (1890 - Sc. #39) - Green. 10 P. (1890 - Sc. #40) - Carmine, Rose. 20 P. (1892 - Sc. #41) - Orange, Yellow. 25 P. (1889 - Sc. #42) - Ultramarine, Blue. 01 M. (1890 - Sc. #43) - Brownish Gray & Rose, Slate & Rose. 05 M. (1890 - Sc. #44) - Green & Rose. 10 M. (1890 - Sc. #45) - Brown & Rose.